James W. Cheevers, Senior Curator at the U.S. Naval Academy Museum, sent along this detailed email on the history represented by this engraving, from which I quote below. "This line engraving is definitely post Civil War. 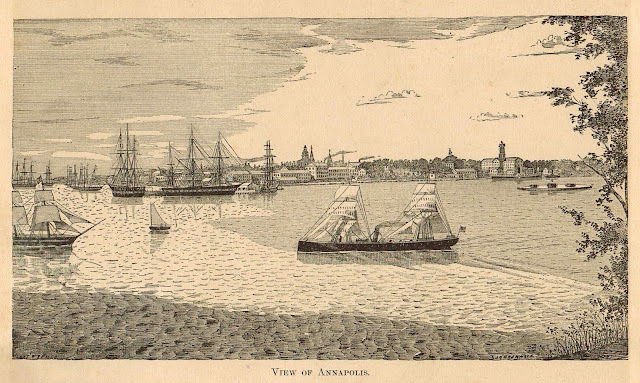 It is a view of Annapolis from across the Severn River with the Naval Academy main pier left of center surrounded by ships, a good view of the seaward side of Stirbling Row, the Maryland State House sticking up at center, McDowell Hall at St. John's College, a clear view of the Academy's Steam Engineering Building (1866) and New Quarters or Cadet Quarters (1868) with a copula out of perspective by sticking up too high in proportion to the building. "I think the three-turreted monitor is a mistake, too. I have record of seven different monitors visiting and/or serving the Naval Academy between 1866 and 1910, but none of them had three turrets. Those with double-turrets included USS Amphitrite, formerly Tonawanda; USS Nevada (BM 8), and USS Terror. I think the monitor is probably meant to be USS Amphitrite which had a funnel between its two turrets that when retracted could have been mistaken from a distance as a turret. It was used at the Academy for training between 1866 and 1872. "I note that there is an inscription lower left. It looks like the words Fleet and Puck. Puck was a magazine from 1871 to 1918, but its illustrations were primarily cartoons. There appears to be another inscription on the right where the dark water meets the land. It seems to end in "weed" so it could be an artist's name. If are able to better decipher either of these inscriptions examining the original up close, let me know what they are because we do have reference books on artists to perhaps help you further. Erratum: Peter Belenky, who it turns out has done marine etchings, points out that I originally erroneously categorized this print as an etching when it is actually a wood engraving. I've pulled his detailed comment over to the main post and made the appropriate corrections to the main post. Thanks Peter for the education. "Not an etching, but apparently a wood engraving. In both processes, ink is rubbed into grooves on the plate and wiped off the surface. Then paper pressed down picks up the ink. In an etching, the principal means of creating grooves is scratching the design through a varnish coat on a metal plate and bathing the plate in acid. In an engraving (metal or wood), the grooves are gouged with tools. These are "intaglio" processes, meaning that the lines are printed where the surface is cut away. In the alternative "relief" process, like book printing, the blank spaces are below the surface and ink is rolled onto the raised surface to be printed. "The wood engraving process was the chief means of publishing images in magazines of the Civil War period, and many of Winslow Homer's drawings and paintings from the front were reproduced and circulated in this way. More from James Cheevers: In response to a further inquiry of mine about the dock with the paddlewheeler at the top right of the engraving, Mr Cheevers sent along some further fascinating details. "Yes, there was a wharf at the end of Maryland Avenue on the Severn River. It was not a public wharf after 1847 because the Federal government had purchased the property as part of the first expansion of the new Naval School at Annapolis. In the post Civil War period the wharf was called Phlox Wharf after the screw steamer USS Phlox, built in Boston in 1864 as F. W. Lincoln and purchased by the U.S. Navy. Phlox had seen active service during the battles of Fort Fisher and then was reassigned to the U.S. Naval Academy when it returned from Newport, RI, to Annapolis. Phlox served as the academy's ferry or water taxi from 1865 to 1873. "There had earlier been an additional pier at the end of Tabernacle Street, later College Avenue, but I think by the Civil War period it was gone. Header Photo: R2AK - A Luddite Hero? "Like losing your virginity. You're glad you did it but embarrassed by your performance." "I'm bored of being bored." Truth be told, the organizer of the R2AK originally envisioned this race as one for the Tim Penhellow's of the world, an ultra-marathon grit and grind up the western wild coast of Canada, where human-power is just as important as sail power. Unfortunately this narrative for the R2AK only plays out in the boats under 20' of length. Several millennia of history have pointed out the fastest way to eat up the miles in non-carbon water transport is a sailboat. Fast sailing beats a fast rowing boat every time - and there is no better fast sailboat then the modern multihulls, who this year made the 720 mile R2AK a three day sprint (for the winners). As a race for the prizes, the R2AK is now a long distance multihull race, the R2AK adding some navigational wrinkles and spectacular coastal scenery as compared to a slog in the ocean. The guys that do the R2AK with boats under 20 feet - 2016 Luddites, all of them. They will finish weeks after the multihulls, but I tip my hat to all of them. Congratulations to Tim Penhellow, to the other small boat adventurers in the R2AK, and particularly to the older duo, Heather Drugge and Dan Campbell, racing the only sailing dinghy, a Mirror 16, who managed an incredible 600 miles before pulling out. Further proof of why racing a Swampscott Dory in the R2AK is like bringing a knife to a gun fight - video from day 6 of the 2016 R2AK. Music Whenever: The Lumineers, "Cleopatra"
I heard this on the radio and it captured me. The Lumineers have a new album out; some of the hits on the new album are boppy, folky, stock love songs, but this one is different. A song of despair, regret, a life that branched into treading water when the love of the life is dismissed. Supposedly this a true story as related by a female taxi driver the Lumineers met in the Republic of Georgia. Great, poignant lyrics. 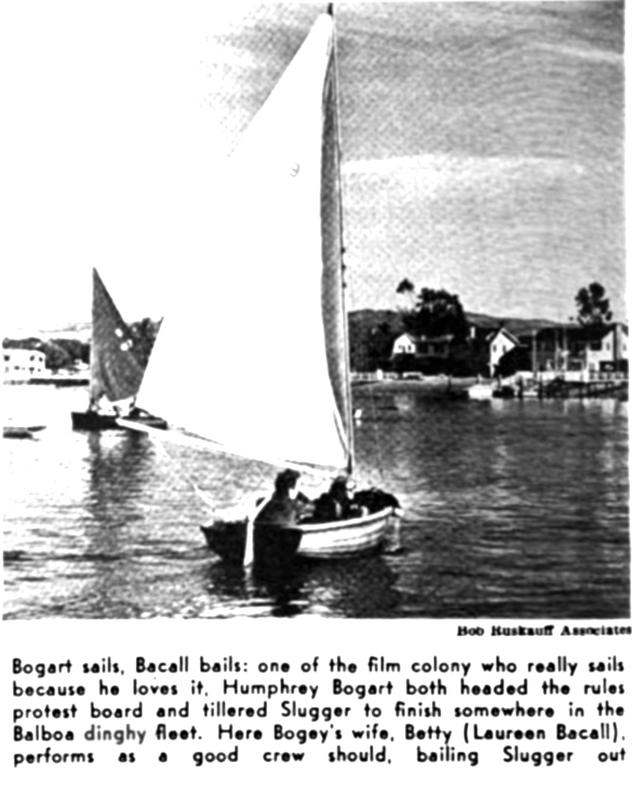 "Bogart sails, Bacall bails: one of the film colony who really sails becasue he loves it. Humphrey Bogart both headed the rules protest board and tillered Slugger to finish somewhere in the Balboa dinghy fleet. Here Bogey's wife, Betty (Laureen Bacall)(sp? ), performs as a good crew should, bailing Slugger out. I'll always appreciate the artwork you'll find on the covers of these old magazines. 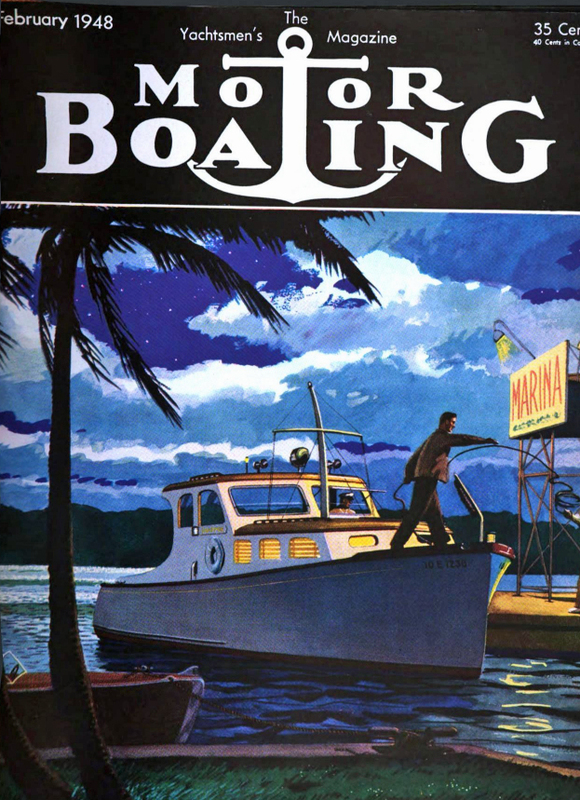 TOH to Google for their continuing effort at digitizing these old magazines. "I was introduced to sailing when invited by a schoolmate to crew in his Cherub. Three seasons later it was time to move on to my own boat. My family couldn’t afford a decent Cherub, but we could afford a very decent Australian Sailfish. 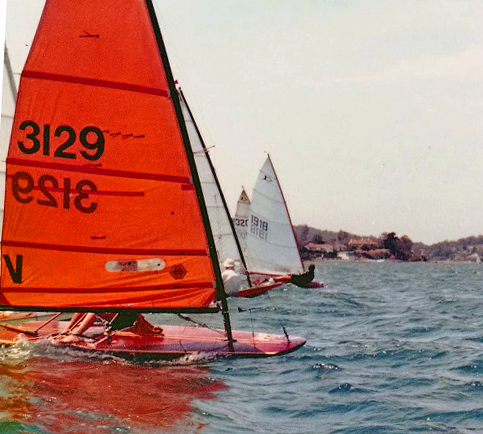 And, despite crewing for three seasons, it was on the Sailfish that I really learnt to sail and learnt to race. Simple, very strong design and therefore a durable boat. One-design. In no sense a development class like the Moth. Unsinkable. Bailing obviously not necessary. Easily stowed in garage or car-port. "The Sailfish was strictly one-design. Through my sailfish days, Jack Carroll was the National Registrar of boats and was, as I recall, official measurer at all the National Championships I attended. He took his job seriously. The only allowed optional variation in hull shape was in the 6 “ nose-cap forward of frame number 1. The plans showed a rounded nose-cap but, by the time I became interested in the Sailfish, there seemed a general agreement that for a hull with a very shallow V-shape which was sailed to windward heeled on its chine, it made no sense to sacrifice 6” of waterline length along that chine. "As well as strict one-design, there was a strict limitation on in-race rig adjustment. In-race adjustment of luff tension, foot-tension, stay-tension and boom-vang tension was prohibited. 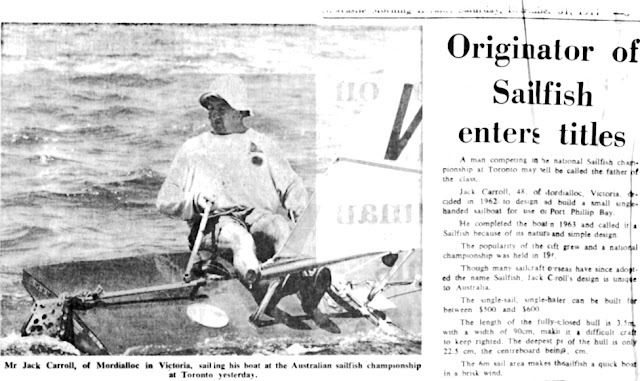 I don’t think this affected the quality of racing as the rule clearly was the same for everyone, although it possibly affected an individual skipper’s sailing education. It made us good weather forecasters. Mind you, if there was an unexpected weather change before a race but after boats had left the shore, it was common to see several Sailfish inexplicably capsized while their skippers frantically adjusted boom-vang tension before the 5 minute gun. "The Sailfish is a light and narrow boat, with a beam of only 2’ 10 7/8”. It is therefore a very tender dinghy. In view of this characteristic, there was an evolution over the years to a lower rig so as to lower the C.E of the rig and hence reduce the heeling moment. The Victorian sailors took this to its extreme, with a low boom position accentuated by a lot of mast rake and mast bend. This is illustrated well in the photo you posted of a championship start - Sailfish 3129 and Jack Carroll’s boat next down the line (both from Victoria) have much more mast bend than my boat (1918). With his mast rake and bend, Sailfish 3129 would have had a marginally lower boom position than most of the boats from New South Wales. The Victorian skippers were always very keen to be as close-winded as possible. To achieve this they sailed with flatter cut sails, a lot of mast rake and mast bend as already mentioned, and with high luff, foot and vang tensions. To my mind however it made no sense to sabotage the off-the-wind strengths of a shallow-V hull, so my rig had a sail of greater chord depth, much less mast rake and a stiffer mast with bend controlled by diamond stays. I never enjoyed being caught to windward of a Victorian boat because of the danger of being lee-bowed, but mine and some of the other NSW boats could at least match them to windward, and then we would usually have a definite speed advantage downwind. "Gybing was a challenge, both because of the low boom position but also, and more significantly, because of the narrow beam. Many a Sailfish race has been decided at the wing mark. There certainly was a technique involved, particularly in heavy weather. It used to terrify me as a junior. Many skippers gybed in a kneeling position, keeping their head and bottom as low as possible. The problem with this technique was that the skipper had to come out of the hiking straps before the gybe, and then not be in an optimal position to regather the straps after the gybe. Note that the straps used in any sort of breeze were those aft of the mainsheet track. 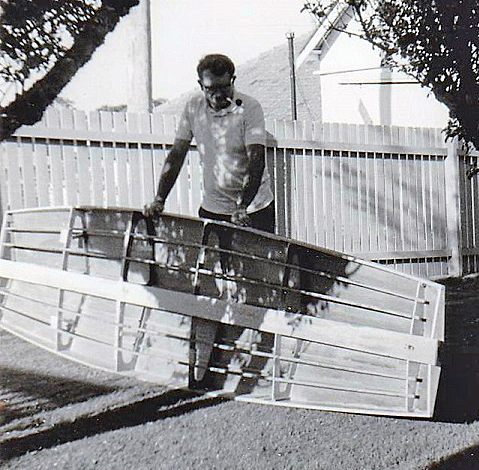 "My technique began with ensuring that the centreboard was as far up and raked as it could be without catching the boom. Just before the gybe I would extract my front foot from the hiking strap and position it in front of and to windward of the mainblock. As I gybed I would lay backwards (ie supine) and pivot and slide on my bottom across the deck to the other side while releasing my rear foot from the straps. The previously front (now rear) foot would be slipped under the straps and I would be hiking out again. I never whacked my head and this technique gave full control throughout the gybe. 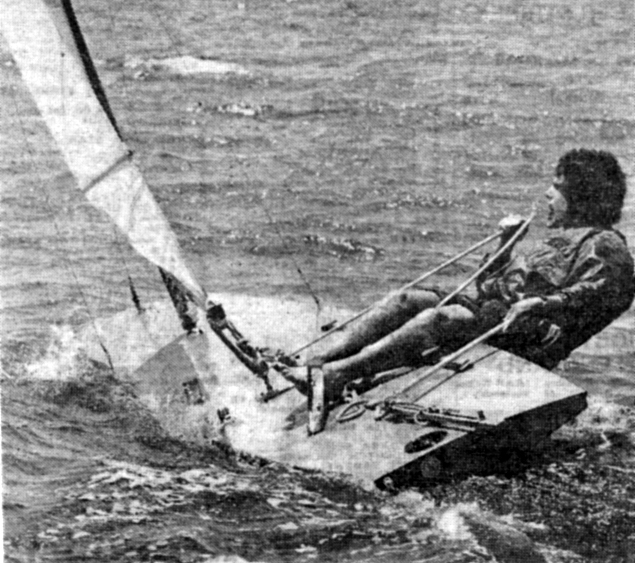 I would always attempt to gybe, even in very heavy winds. I would concentrate on ensuring that the boom crossed the midline of the boat so that, even if I capsized, the sail would be on the new tack. The Sailfish was so easily righted after a capsize that I found this much faster than attempting a granny manoeuvre. Of course, if you pulled off the gybe you could look back and chuckle at the carnage. "With a fine, horizontal bow, the tendency of the Sailfish to nose-dive when reaching downwind with following waves made life interesting. The skipper had to hike out over the aft windward quarter hanging on by his toenails. A gybe in those circumstances was especially challenging and had to be carefully timed. In contrast, surfing across waves on a shy to three-quarter reach was absolutely exhilarating. “Janus” remains in my garage in pretty good condition 46 years on. She shares the garage with a nearly completed Iain Oughtred-designed 15’ 8” MacGregor sailing canoe. Apart from a similarly narrow beam and an Australian designer, they have absolutely nothing else in common. Click here to go to the post featuring the plans for the Australian Sailfish. Chris Cleary, three time Australian Sailfish champ in the 1970's, sends along some of his photo collection as well as his observations of the Australian Sailfish. "The Sailfish is a light yet incredibly robust little boat, able to punch along in heavy conditions that can force the retirement of other dinghies. It is quick to plane, and hugely exciting off the wind, especially in a good breeze. "...the Australian Sailfish originated in Victoria. In the 1970's there were strong club fleets in Melbourne and country Victoria. In New South Wales, there were clubs fleets in Sydney, on Wentworth Falls Lake in the Blue Mountains, and on the Nepean River at the foot of the Blue Mountains. 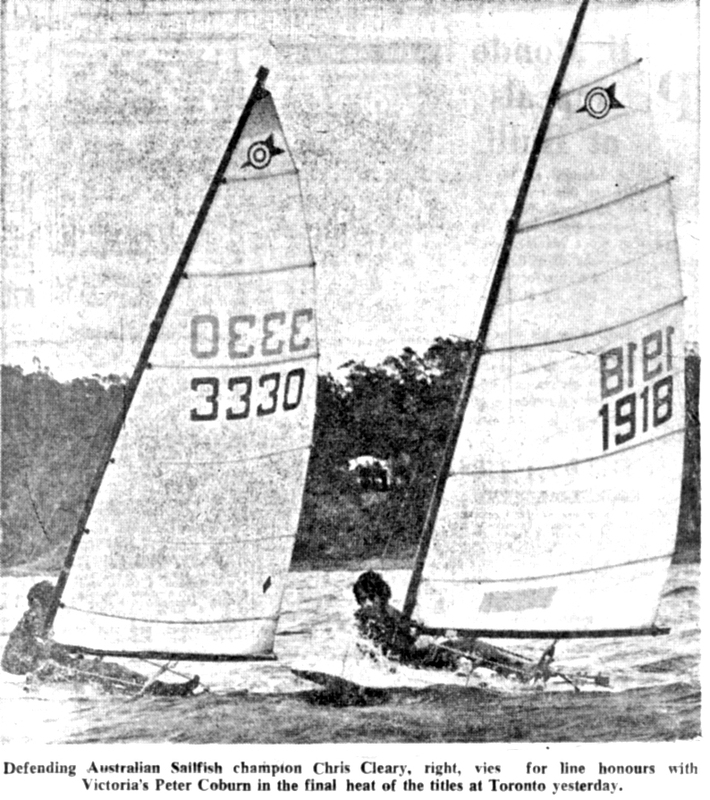 There were also boats racing in Queensland and also, as I understand, in Papua New Guinea. Click here for Australian Sailfish plans. From a newspaper article, a photo of Jack Carroll, one of the designers of the Australian Sailfish. Chris built his championship winning Janus in 1970. The frame and stringer construction is well shown in the two following photos. Chris in Janus in some breeze. A photo of one of the starts at a Championship. Chris and Janus featured in the newspaper. Two other racing photos from the newspaper. 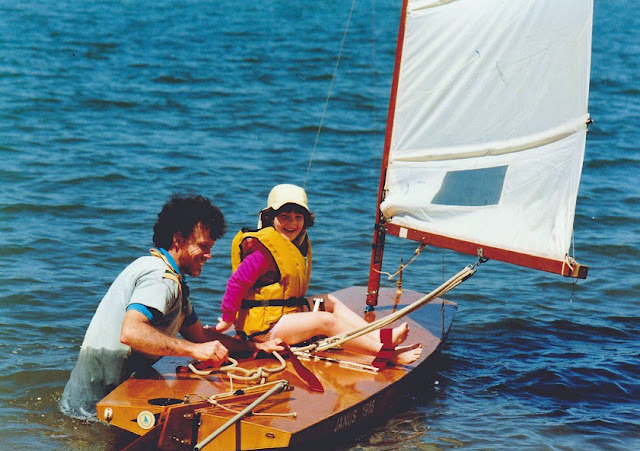 The Australian Sailfish made a good father/daughter sailboat for Chris. I'm guessing that Chris is around the same age as the blogmeister and this is a more recent photo. At our age, I also pile on as much protection from the sun as possible. Chris writes that Janus still gets wet at least once a summer. 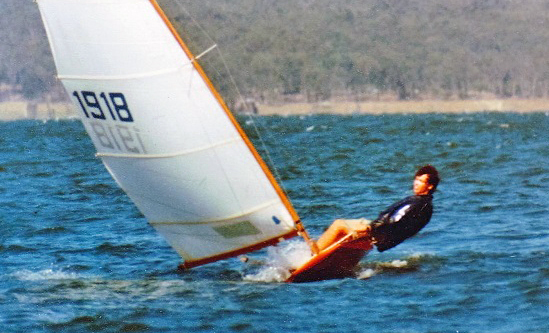 As promised, here are the plans for a sit-on-top sailing dinghy, the Australian Sailfish. 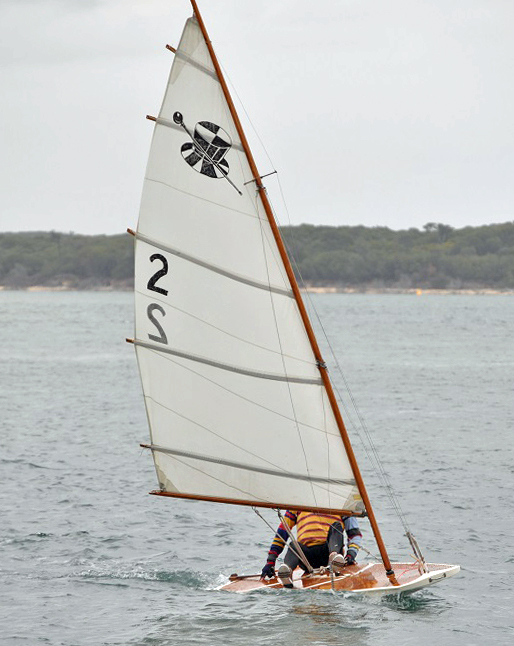 The Australian Sailfish is a scow version of the American Sailfish, designed in 1958 by Bruce Scott and Jack Carroll. Designed for home construction, 780 plans of the Australian Sailfish were sold. I've chunked images from the original plans into a PDF file that can be printed out. Unfortunately frame dimensions are given as given as linear dimensions along the plank edges which might make it more difficult to lay out the frame dimensions (instead of plotting X,Y coordinates). There is enough information in the PDF plans for a competent builder, with some head scratching, to complete a hull. The rig is a stayed marconi with full battens. A carbon windsurfer mast would work fine if one wanted to go hi-tech. Many thanks to Andrew Chapman for providing the Australian Sailfish plans. Australian Sailfish No. 2 at the 2016 South Gippsland Y.C. 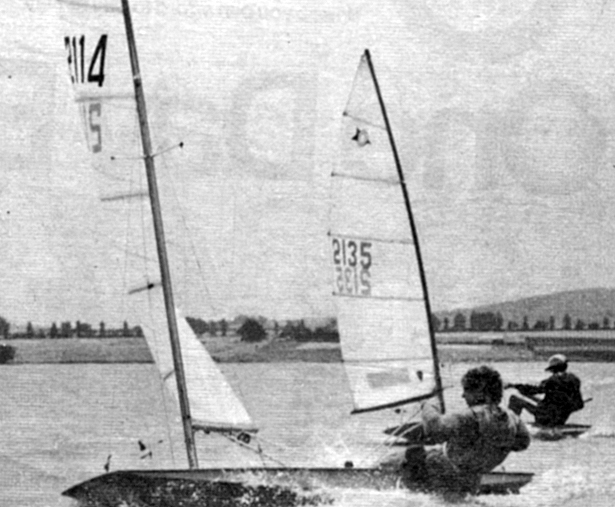 Classic Dinghy Regatta. 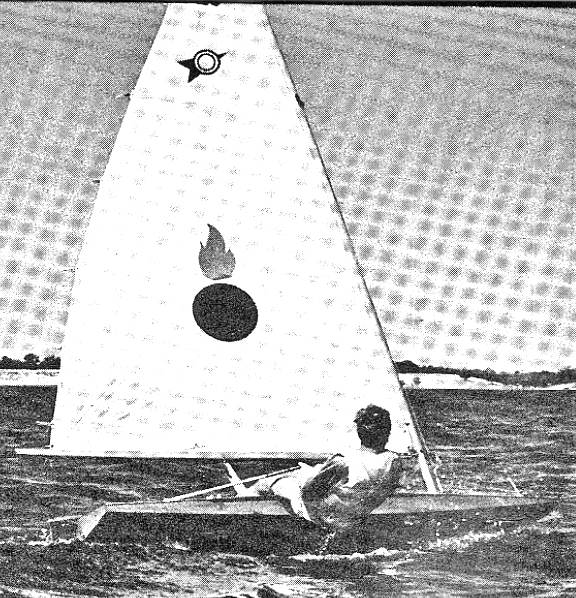 A sailing image from the Australian SeaCraft magazine. To view the PDF plans in another browser tab (or to print the PDF file), go to the top right corner of the PDF window and click on the pop-out icon (box with an arrow pointing to the right). 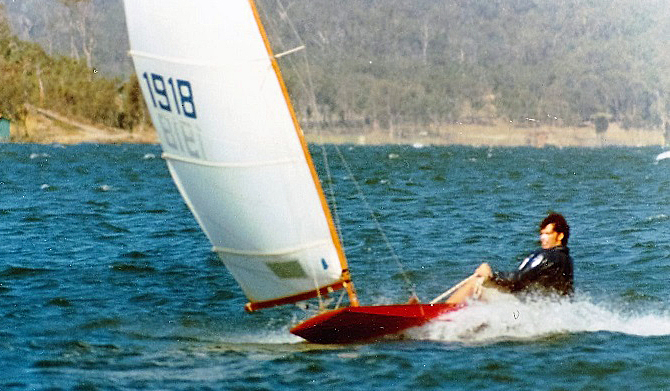 Australian Chris Thompson, who wrote an excellent, unpublished history of dinghy racing back around year 2000, has decided to put his extensive research up on a blog. I think his intention is to eventually publish, either digitally or in book form, but, for now, the posts on his blog are very informative for that small cadre who study small boat sailing history. Best to start with the Introduction to SailCraftblog and follow the links from there. The sound effects from this International 14 video really capture the high-speed hopping, and pounding, and slamming these twin-trap assymetrics experience going downwind. Video shot from the spreaders. Companion video of a 14' Javelin dinghy motoring along over here. Messing about in a 14 from Dan Cunningham on Vimeo.